•LabelOnce food storage labels can be put through microwaves, dishwashers, fridges, and freezers many times over. You will be pleasantly surprised at how long these labels hold up under extreme conditions without deteriorating. It's as if the label was built in the container. Works on smooth plastics, glass, and stainless steel. Not suitable for use on things you plan to use on stove top or conventional ovens. 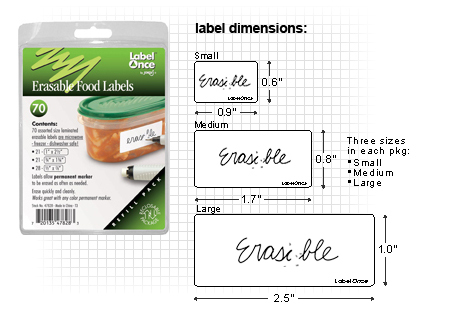 MFG-47828 CONTENTS: 70 total erasable labels (21 large, 21 med, 28 small) with a plain WHITE background for food containers in a non-PVC, transparent, reclosable/reusable clamshell package.